In common with dozens of countries around the world, Singapore is struggling to contain the spread of piracy-configured set-top boxes. Branded by industry as ‘ISDs’ (Illicit Streaming Devices), these products enable consumers to access a wide range of content – usually movies and TV shows – over the Internet without paying an associated fee. The disruption caused by such devices, which often contain Kodi add-ons and software applications such as Showbox and Mobdro, is regularly criticized by industry players who feel that copyright legislation isn’t always in step with advances in technology. In Singapore, such devices currently sit in a legal gray area but that position is set to change later this year with a range of proposed amendments to copyright law published Thursday by the government. The product of a three-year review by the Ministry of Law and the Intellectual Property Office, the Copyright Review Report details measures to criminalize and impose civil penalties on those who make, import, or commercially distribute piracy-configured media devices. While current law is capable of dealing with infringing items such as pirate DVDs, so-called ISDs contain no infringing movies or TV shows at the point of sale. The proposed amendments close this loophole, and then some. “Our policy position is not to allow commercial gains derived from enabling access to content from unauthorized sources,” the review paper reads. “A DVD may hold unauthorized content, while a set-top box which streams content may not hold the actual unauthorized content itself. However, we do not view this as a material difference. While the proposals aim to prevent manufacturers, importers, distributors and retailers from knowingly selling devices already set up to access infringing sources, they also claim to close a potential loophole. In some cases, perhaps understanding the thin line between legal and illegal supply, some sellers of media boxes have supplied them without any piracy-enabling software installed. Instead, they provide assistance or instruction to the customer on how these may be added at a later point, post-sale. 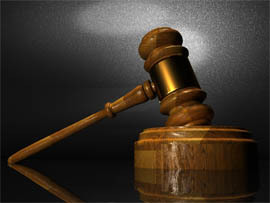 In these cases, the intent and knowledge of the seller will be taken into account. “[T]o incur liability, the retailer should have some degree of knowledge that the device in question can, and very likely will, be used to access content from a source that is not authorized by the rights-holder,” the proposals read. This will cover people who sell boxes ready-configured, those who advertise their products for infringing purposes, and those who provide assistance to buyers in order to enable their devices for piracy. So far, the proposals deal with device sellers but there are also those who do not sell devices but instead specialize in setting them up for piracy purposes. 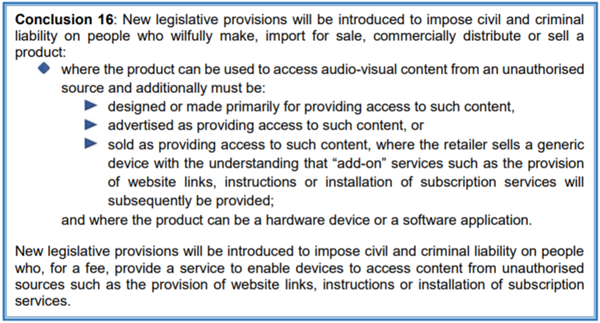 The proposals are also set to target people who, for a fee, add infringing capabilities to media devices by installing or providing software, such as Kodi add-ons and similar tools. Speaking with TorrentFreak, Neil Gane of the Asia Video Industry Association’s Coalition Against Piracy (CAP) says that the ISD problem is the most important copyright infringement issue in Singapore but dealing with it under current law is not straightforward. “We are glad the government has recognized that this lack of legal clarity had allowed ISD retailers to mislead consumers that the content accessible through such TV boxes was legal and that requisite subscription charges went to rights-holders – which they did not,” Gane says.